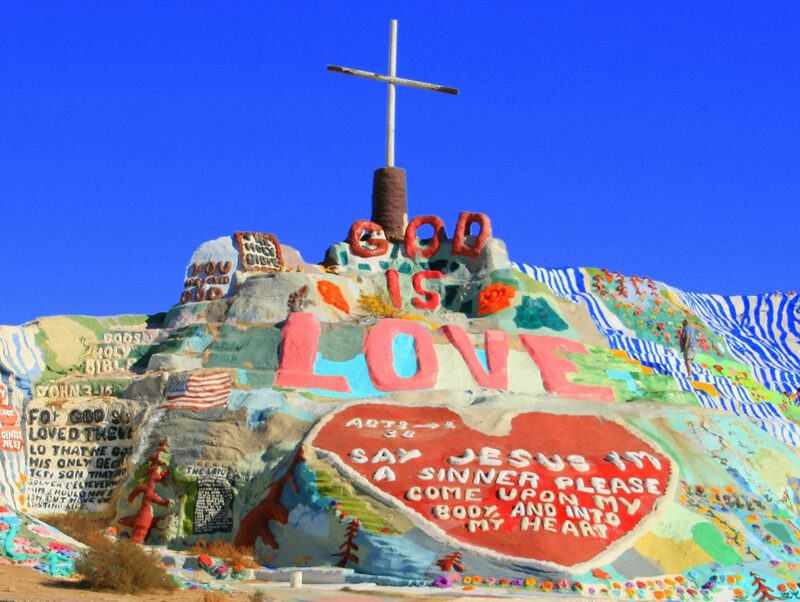 Leonard Knight worked for more than 30 years to build Salvation Mountain, a 50×150-foot visionary art environment in the desert just east of the Salton Sea. Religious scholar Sara M. Patterson spent months at Knight’s camp interviewing him about his art, his faith, and his backstory for her new book Middle of Nowhere. She tells the story of Knight’s religious epiphany and attempt to create a hot air balloon for God before deciding to build a mountain marked “God is Love.” His first effort, composed of found objects, collapsed in the 1980s. Knight configured a second from straw bales he converted into giant adobe bricks with mud and countless layers of donated latex paint. The self-taught artist worked his homemade clay into representations of Bible verses and scenes and built a museum inside. Knight, a veteran conflicted by his role in the Korean war, lived in one of his fleet of art cars and received daily visitors; some brought art supplies and others brought camera crews. Sean Penn, Coldplay, and of course Huell Howser filmed there twice. The documentary Salvation Mountain: The Movie was one of the last to film Knight before he passed away two years ago. The mountain is still standing, but for how long? Without daily maintenance driven by Knight’s religious fervor, the mountain will probably melt back into the Earth. The surface has developed cracks and parts of the face are falling away. The paint warps under the feet of visitors and Patterson isn’t alone in thinking the mountain will eventually disintegrate. The author discussed the future of Salvation Mountain with Jo Hernandez, director of SPACES—a nonprofit that focuses on the study, documentation, and preservation of art environments and self-taught artistic activity.